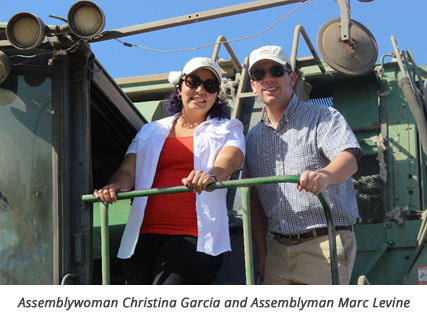 Assemblywoman Christina Garcia (58th Assembly District – Downey) and Assemblyman Marc Levine (10th Assembly District – Marin) toured several farms and processors in the valley. Association staff on the tour included President/CEO Roger Isom, Director of Regulatory Affairs Aimee Brooks, and Director of Technical Services Christopher McGlothlin. The tour included stops at citrus orchards, table grape harvesting and packing operation, aerial applicator operation, cotton gin, cotton field, dairy and pistachio operation. The tour included a ride on a cotton picker at grower Mark Trigueiro’s farm. Several issues were discussed during the tour, but the focus was the effects of the prolonged drought. Participating with the Association was the California Fresh Fruit Association, California Citrus Mutual, California Dairies Incorporated, and the California Agricultural Aircraft Association. The tour was part of the Association’s ongoing effort with the Agricultural Presidents Council (APC) to reach out to urban legislators to educate them on the critical issues impacting agriculture in the state. This entry was posted in NEWS & ISSUES on October 13, 2014 by ccgga.